Buy all materials and equipment in a good working condition. Place a water pump in Tank B, with the pipe leading into Tank A. Place a water pump in Tank A, with the pipe leading into Tank B. Create a open circuit with 2 wires and a battery. Place the gap in the circuit in the Tank A at the required level and tape it to the tank’s side. Repeat Steps 5 and 6, placing the water sensor in Tank B this time. Open the pumps plug and connect the positive and negative wires to the relay units. Connect the relay units to Arduino. Connect the water sensors to Arduino as well. Code Arduino to time the pump startings and endings, such that each tide lasts for 6 ¼ hours. The pump in Tank A should switch on first. The pump will work in this sequence: work for 230, rest for 230s, work for 230s, rest for 460s, work for 230s, rest for 690s and so on for 3 ⅛ hrs (11250s). This will create a high tide in Tank B in a sine curve. 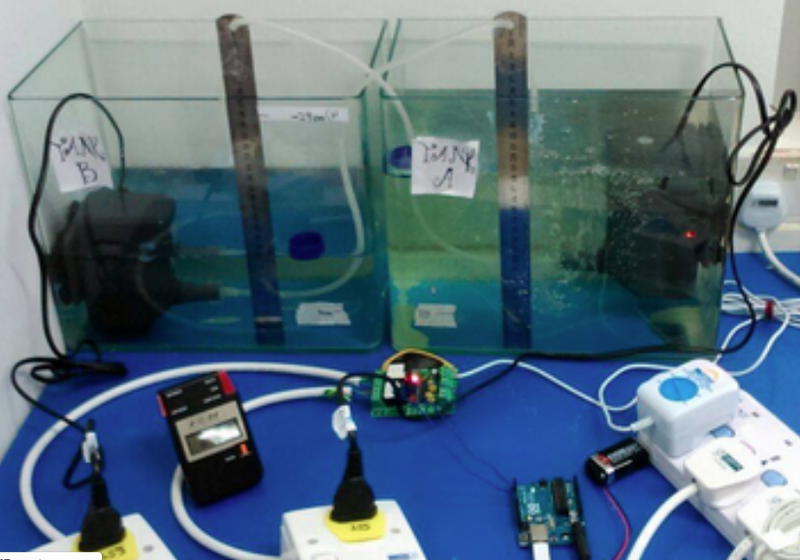 Once the water level in Tank B reaches the water sensor, Arduino will switch off the pump and begin the one in Tank B instead. The pump in Tank B will work in the same sequence as that in Tank A for another 3 ⅛ hrs. At the end of the 3 ⅛ hrs, Tank B should have a low tide. This way, each tide last for 3 ⅛ + 3 ⅛ = 6 ¼ hrs. When the water level reaches the sensor in Tank A, the pump in Tank B will be switched off and that in Tank A will turn on, repeating the process in a cycle again. After the process is confirmed, label the tanks at certain water levels so it will be easy to identify the water height at any time. Take a video and pictures of the entire process from the 1st hour to the last. Record down all data collected in a table. The water level in tank B at each hour will be easily seen from the video and the marks. Transfer the data onto a graph for analysis. - As we are dealing with water, we have to be careful not to slip on any spilled water. Since our project revolves around water, we will be dealing with a lot of water, which will be transported from one place to another many times. Thus there are high chances that the water might spill from the containers when it is being moved around. We may easily fail to notice the spilt water and unknowingly walk on it which will probably cause us to fall. This can be quite severe since we may fall in dangerous manners that could lead to even a fracture. Therefore, to make sure this does not occur, first of all, we have to careful when we move the water around and should any water spill, we should immediately mop up the spill or warn others of it. - We have to be careful when carrying the tanks as they have sharp edges or might break. The glass tanks we will not only have sharp edges, but they might break easily as well should it be dropped. While we are carrying the tanks around, we might cut our fingers along the sharp edges of the tank or drop it accidentally, which will cause the glass to shatter and scatter many sharp glasses pieces around the floor. These glass pieces, being small and transparent, might go unseen by us and it could easily poke through our skin if we accidentally touch it. These cuts will cause intense bleeding and might even harm our vital veins or cause infections if the wound is not cleaned properly. To prevent the glass tanks from injuring us, we have to make sure we do not touch the rough, sharp edges, hold the tanks firmly while shifting it and also place the tanks on smooth surfaces in such a way that it cannot fall off the table it is placed on. - We will be using tools, such as a drill, so we will have to be careful around those. The tools we will be using such as drills, are quite dangerous as they might have sharp tips or they might be heavy. Although most of the tools are probably equipped with safety precautions and a supervisor will be watching over us while we operate the tools, we still have to take precaution since injuries can still be caused. The sharp tips of the tools, such as drills might skewer our skin or someone might unintentionally drop a heavy tool onto their foot. These are some hazards caused by the tools thus we should always be cautious. - As electricity conducts water, we have to ensure that the water doesn’t touch any uncovered wires or switches and not to touch any electronics with wet hands. Water, being a good conductor of electricity, will easily conduct the electricity from any electric appliances, such as wires, and if we come into contact with the electrified water, we will be electrocuted, which is quite painful. Such instances might occur if we accidentally drop any electrical appliances into the tanks filled with water or perhaps touch electrical appliances with wet hands. Therefore, to avoid this hazard, we should always be careful near the water and make sure electronics are kept at a safe distance from the water tanks. Also, we should always wipe our hands after touching the water so that we do not unintentionally use electrical appliances with wet hands. We had up a video camera near the tanks to record how the water level changes. The tanks were marked at various levels so we can tell how much the water has risen or fallen from the video. The video was also properly timed. We then watched the video and recorded what the water level is at certain intervals on a table. The tabulated data was then transferred on to a graph. The graph has the y-axis labeled as the “height of the water” and x-axis as “time”. We plotted the graph and joined the crosses up to plot a curve. The curve was a relatively smooth one with gradual rises and falls if the engineering is up to standard. With the data filled in the table, we will be able to plot a graph that looks like the one below. A smooth sine graph with each high tide at a difference of 12.5 hours.